AJ Foster is a stand up comic and writer known for his appearances on Fox’s “Laughs” and AXS TV’s “Gotham Comedy Live”. His witty observational humor paired with his laid back delivery captivates audiences and makes them just as comfortable as he appears on stage. Combine that with his South Bronx charm and contagious smile and you have a comedian who is both lovable and relatable to people of all ages and backgrounds. AJ has opened for many of the country’s top comedians including Damon Wayans, David Alan Grier, John Heffron and Jay Pharoah. He has been featured at some of NYC's top comedy clubs, including Caroline's on Broadway, in addition to regularly performing at various clubs and colleges across the country. 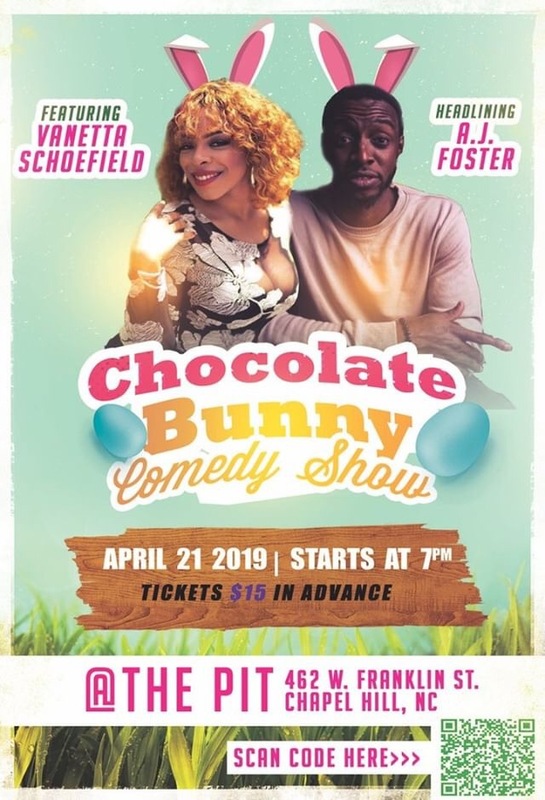 Also featuring North Carolina’s own, Vanetta Schoefield! Southern Belle turned City Beast, Vanetta Schoefield is a determined force & advocate for herself & underrepresented women. She speaks up for them & herself through stand up comedy, activism & monthly show, “Funny Hunnyz”. It’s not about dismantling patriarchy, but promoting the power of the woman in her natural state.